The face is one of the earliest areas to show signs of aging. Crow’s feet around the eyes, vertical “frown lines” between the eyebrows, or lines in your nasolabial folds can make you look older than you are. Fortunately, there are many minimally invasive, nonsurgical facial rejuvenation options to reduce the appearance of these wrinkles as they start to form. BOTOX® Cosmetic is one of the safest and most effective ways to correct early signs of aging caused by wrinkles and fine lines in the facial region. At Grossman | Capraro Plastic Surgery, we can help you revitalize your appearance with BOTOX Cosmetic so that you will look and feel your best. Call 303-320-5566 to learn more about this popular injectable. The formation of wrinkles is an inevitable part of the aging process. Routine daily actions such as squinting in the bright sunlight or laughing with your friends cause the muscles in your face to contract. Over time, these muscle contractions will create lines and wrinkles on your face. BOTOX Cosmetic does not work like dermal fillers, which restore lost facial volume to provide a more youthful appearance. Instead, BOTOX addresses the cause of these wrinkles by temporarily paralyzing your facial muscles, preventing them from contracting. Within a few days, the wrinkles formed by these contractions will fade, giving you a smoother, more youthful complexion. 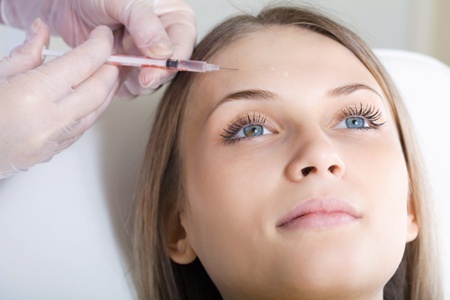 Your BOTOX treatment can be completed in one short visit to our Denver plastic surgery office. There is no downtime, and you can return to work immediately. BOTOX Cosmetic is injected into the targeted areas using a fine needle. The procedure is painless, and can be completed in about 20 minutes. You can expect to enjoy your results for approximately three to six months. For longer lasting results, you will need to return to our office for a touch up procedure. Please contact Grossman Plastic Surgery online or call us at 303-320-5566 today to schedule your initial consultation. We serve patients in Denver and Littleton, Colorado.